That Kate is alone at times, I can understand. But she is ALWAYS alone. Not even a shopping trip with her sister. Or a luncheon with friends. And that Kate has a 'busy' life is nonsense and many of the female friends in William's circle aren't exactly the high potentials of the City either. No one is making 60-hour work-weeks. And even if they do, I work more than 40 hours a week but I see friends on a weekly basis. Not always the same friends; with one you go shopping, the other is the weekly tennis-'date', another one is a theater-friend, a bookclub etc. But with Kate there is just nothing of the kind. And with the press always staking out, we would have known if f.e. one of the Van Cutsems would have been over for lunch. And we would have seen Kate shopping with Emilia d'Erlanger. Kate being alone has nothing to do with the kind of life she leads, but everything with the kind of person Kate is. She ditched her friends in the process of showing William how trustworthy she is and she has ended up with being the fifth wheel in the circle of friends of William (and Harry). I tend to agree with TCOH. I highly doubt Kate knew what she was getting herself into, although personally I have come to the conclusion that she does genuinely love Willy - goodness knows why, but it's just my opinion that she does. However, I think if Willy had a mistress that Kate would shut up and put up with it. She wouldn't be happy - who would? But I highly doubt we'd ever see the Diana fiasco again. This is where I feel Kate 'could' be the stronger one. I also think in the end she'd keep her husband for shutting up. I don't believe for one second, neither will I ever, that with Diana it was a case of 'what we see is what we get'. I wouldn't believe that of Kate either, or any if the RF for that matter. In one way or another most of them have proven to be the epitome of master manipulation - whereas I don't think Kate has truly learnt this 'skill' as yet - partly I hope she doesn't. It may be a strength if she stays clear of completely manipulating members of the press, although I feel she has attempted to dabble, much of it is possibly done for her. She never looks happy to me, either. Interesting. I had always thought Diana's biggest problem was her lack of cunning. She came across as very innocent and manipulable (in my eyes, at least). Now I'm reading Andrew's book and I'm finding it really interesting. I do feel for the poor woman. I am not royalty but I can perfectly understand how trapped, oppressed and downtrodden she must have felt. All the commoners that have married princesses in the 21st century (Mary, Máxima, MM, Marie, Kate) seem to have found the transition quite smooth. The only one that seemed to find it hard was Letizia (she looked miserable for years until she went under the knife). Yes, all these women were older than Diana was at the time of marrying into royalty but still, your life is turned upside down when you go from being a commoner to being the wife of an heir to the throne. I think the likes of Kate, Letizia and Mary were terribly astute whereas Diana was all about feelings and emotions. That photo says it all. Sad, beautiful, lonely princess. Yes, Kate has tough skin alright. Just like a rhino. Willy Worm has a thing for rhinos. I don't know much about Cressida but Chelsy did seem to run away from it all. Can't blame her. It takes guts to marry into royalty even if your husband is not the heir to the throne. Right now I'm thinking of Camilla. I wasn't sure she would have what it takes to embrace royal life and she seems to be doing just fine. After all, when she was Charles' mistress she had the perks but not the work (it's the ideal situation). Anyway, I do think Kate is stronger than Diana or, at least, more determined. 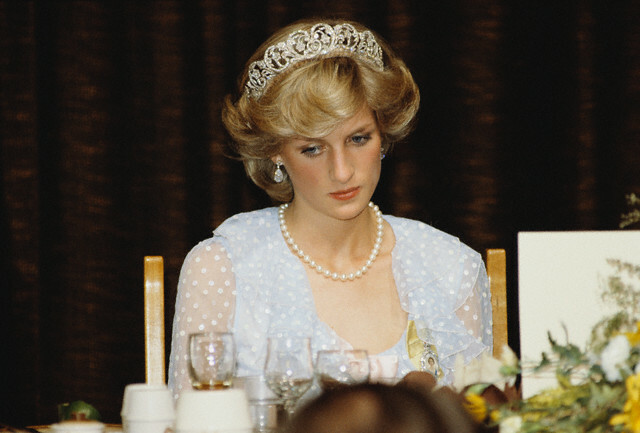 Poor Diana had to struggle with depression (I know what that is and I wouldn't wish it on my worst enemy). The Stalker is strong but only because she is programmed by The Viper. Diana did just fine in royal work. I think anybody would be depressed by hubby carrying pictures of the other woman on the honeymoon for starters. She would not be jumping for joy. And once she got out of the no win situation she got the eating disorder under control. Let's give her some credit. Kate had people taking care of her and supporting her for years--she was never really on her own. I don't think she's stronger than Diana. Diana worked hard and had the work ethic kate lacks. I'm wondering why Kate has to be "eased in" to work if she is considered "strong." She has to be 'eased in' because if she started working full time at the advanced age of 58 that she is, Waity would have a stroke. I think that the smoke has gone straight up the chimney for Kate. At some stage in her life she will have to deal with "stuff". How she will cope we don't really know. The most she seems to have had to cope with at the moment is some morning sickness. Yes, she is in the public eye but she knew that was going to happen and she made the choice. I agree that she's going to have to face her 'stuff' sometime; the same as others did before her and I highly doubt she will come out of it much better. In reality it's very hard to compare one person to another. ^ ^^ yes but to some extent all young people from affluent - even affluent middle class backgrounds - are like hot house roses. They have been insulated from a lot of realities by affluence so they have not been tested nor have they had to accept the kinds of responsibilities their grandparents accepted. I see it in my own family and my sister and I recognize that to some extent we encouraged it - this protracted adolescence that people engage in nowadays. Not taking on the responsibility and joys of marriage or home owning or even children - dallying around with their careers. My friend has a son who is almost 30 and has yet to make a commitment to a career - he keeps on quitting school or his job to travel or explore his talents etc, And his parents affluence protects him from the consequences (thus far) of his foolishness. Kate and Will and even Harry are exemplars of that generation. Trying on different careers - avoiding responsibilities - living a lifestyle funded by their parents and grandparents wealth not wealth they earn themselves. ^ Marriage and children are not for everybody. Some people find fulfillment traveling the world, some find it developing a career, some find it elsewhere. There's not one right or wrong way to live (as long as you don't harm anyone). Some people dream of having a house and babies, others cringe at the mere thought of that. William is a future monarch, he has a career but is trying to avoid responsibilities of it. Kate is supposed to be working not sitting home playing housewife and being with the kiddies. If she wanted that she married the wrong person--royal wives especially future Queen consorts are expected to pull their weight and work.Kate signed up for this life when she married William and this did not give her the staying home with the kiddies option. A few hours away from the house each week and doing extra work certainly would not hurt George and she has a large staff to assist her with housework in any case. How many "average" housewives can avail themselves of expensive trips and have several homes including big bucks (not hers) spent on a renovation of one of the residences. I think the media spin that she wants to be a housewife and "take care of George" is just spin (aka excuse) made for her laziness and lack of initiative. She can leave the house to shop, vacation, go to galas, and watch sports but leaving for any sort of work would apparently "harm" George. This is just a crock. She and her low life family stalked him because they wanted the riches. I think Kate vs. Diana is a matter of how each came about the ring. Now, Diana started off as openly accepted royal girlfriend and she didn't really wait around for the ring, but she was on a short list and she would have enjoyed royal life anyway. Either way, she didn't have to wait around long and she didn't have to bonk Charles for a decade to get there. Kate, on the other hand, wasn't even on the royal radar and she was someone who was kept a secret until a point was reached when she could not be concealed. She didn't work at all and 'being Prince William's girlfriend" is only on par of being an official mistress, not a 'good' way to begin a way as a wife. She waited a decade. Kate had the ability to 'go the distance' because she didn't have to work at a job or a career or anything else, she was in fact able to retreat to her flat or Berkshire if she couldn't handle the scrutiny or had to retreat to recharge her batteries. She had her family using legal expertise and William to fight the press for her. Diana didn't. Yet, Diana thrived with her work because she discovered a vast world out there and reached out, while looking her best and the press was happy for fashion shots and the public was thrilled by how she reached out to them and enjoyed how she did 'unfashionable' patronages and AIDS work. She reached out and brought a sense of equality that was unprecedented and wasn't a hypocrite about it. She didn't put up some front about meeting people at places she was requested. Kate, she's determined to cut the world out and put everyone in some 'place' and barely looks interested in meeting the people at clinics and at old folks homes/hospices. What makes it worse, is that people know that Kate is out there only because she has to be, not because she wants to be. She obviously 'tolerates' being there. Kate has run out of steam because she used a decade's worth of energy on bonking William, scheming on how to 'move things along,' and spent much of her time wasting her energy on keeping other women off of William and keeping William fooled. That does burn someone out like as not. Poor Diana. May she rest in peace.